Gonzo’s Quest was created by Net Entertainment back in 2010, so it’s been around for a while now, but the graphics and game play are so flawless that it’s easy to forget this isn’t a newcomer to the world of online pokies. 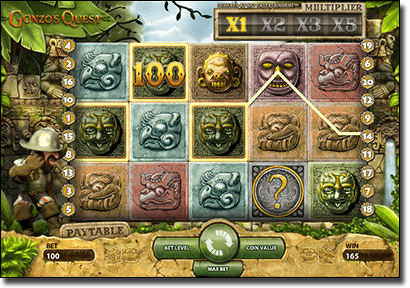 The visuals in this game are of superior quality, making Gonzo’s Quest the leading online pokies game at many of the top-rated online casinos for a considerable amount of time. It provides a great example of what Net Ent is capable of and remains a player favourite even years after the making. This impressive pokies game follows Gonzo Pizzario, a Spanish conquistador on his journey in search of the lost city of El Dorado. Gonzo is actually based on the real life historical character, who was in reality quite a brutal and fear inducing man, but the game overlooks its historical accuracy in favour for fun lightheartedness. Set upon a fascinating backdrop of Peruvian jungle, Incan artefacts and using an attractive colour scheme, Gonzo’s Quest is a notable pokie that will go down in history just like the man it was named after – but for better and more positive reasons. Gonzo’s Quest is available to play for free or real money bets at any of the top-rated casino sites recommended in our table above. These casinos all have secure reputations for providing a safe, reputable space from players all over the world to play online pokies in a trustworthy environment. Slots Million is one of our favourite sites for online pokies due to its beautiful layout, huge catalogue of top pokies titles, range of secure payment methods and quick load speeds with pristine user interfaces. You can play Gonzo’s Quest in practice more for free, or for real money with deposits and withdrawals. Slots Million gives players plenty of incentives to sign up for an account, where new players can claim up to $100 in welcome bonuses. Head to Slots Million to take advantage of these sweet deals and give Gonzo’s Quest a whirl today. Gonzo’s Quest is a five reel, three row video slots game played over 20 pay lines, however players can’t select individual betting lines, making it more like its 243 pokies counterparts. The stand out visual of this game, other than the enticing graphics, is the display of the reels, which takes an “avalanche” form more like a Tetris video game than the usual spinning reels we are used to seeing in video pokies. Each symbol drops down from above to replace a winning line, which looks awesome and adds a unique element to this game. Wild symbol – the wild symbol is the golden question mark and can substitute any other symbol to complete a winning row. Wins must occur from left to right across a pay line. The wild doesn’t bring any of its own wins, and instead impersonates other symbols. Scatter symbol – interestingly enough, there is no real scatter symbol to mention in Gonzo’s Quest, which may be among one of the game’s only disappointments. Gonzo’s Quest isn’t necessarily the most exciting pokies as far as bonus rounds go, but the Avalanche format definitely makes up for that, with the bonus rounds seeming more enthralling than they probably are. In saying that, there are still some great wins to be had here, with multipliers available on every spin adding huge chances to bring in big dollars. Avalanche bonus – Any win across the reels will trigger an Avalanche, where the winning symbols explode and disappear, leaving space for new symbols to take their place. 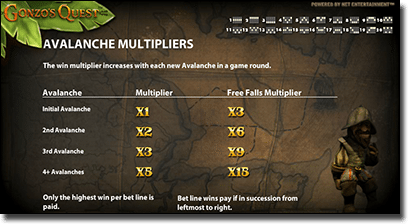 The win multiplier, which is displayed across the top of the screen, increases from 1x to 5x as the Avalanche continues and keeps moving up until there are no more wins. The win multiplier is increased with each new win until the maximum multiplier is reached. A spin that doesn’t make a win will bring the Avalanche back down. Free fall bonus – The Free Fall symbols only appear across reels one, two and three. Activating three Free Fall symbols from left to right will trigger the Free Fall Bonus, which will encourage Gonzo to make his way through the jungle to reveal some sweet free spins. Free spins can be re-triggered during this bonus round, and a winning bet line during the Free Fall activation will trigger an Avalanche. Gonzo’s Quest is quirky, fun and definitely doesn’t skimp on the details as far as the graphics go. There is something so bizarrely satisfying about watching those symbols crumble and disappear in an avalanche format that we just can’t get enough of. The character of Gonzo himself is also a pretty hilarious little guy, which makes this game easy to fall in love with. This Net Entertainment special was ground breaking in its day and continues to set the benchmark for 3D online pokies with its vivid graphics and intriguing layout.